Just in case we all missed it, and I suspect we were supposed to, the House of Representatives recently gutted the rules for Buying American products for federal projects. 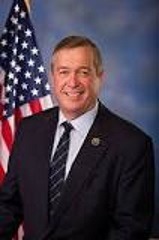 [DWT] What was all that palaver about ‘saving American jobs,’ and ‘promoting American manufacturing?’ Evidently it’s meaningless to Nevada Representatives Amodei, Hardy (happily on his way out) and Heck (happily on his way out) – all of whom voted in favor of the Water and Energy bill (H.R. 2028) from which the HOUSE REPUBLICAN LEADERSHIP had stripped the “Buy American” provisions. It might also be interesting to hear from Senator Dean Heller on the Russian interference with the 2016 presidential election? Yes, 17 US intelligence agencies – not just the CIA – said Russia was behind the hacking. [USAT] There’s no “confusion” over this conclusion. There’s no “false flag” operation – that’s the province of fake news and conspiracy theorists. There’s just no question – and yet Senator Dean Heller (R-NV) has yet to join the bipartisan call for Congressional investigation of this important matter? If a foreign country can hack in and seek to manipulate a U.S. election, what’s to say it can’t gather blackmail-bait on the Republicans as well as Democrats? And that sums up the beginnings of the Trumpster’s administration. A bit of time spent watching local television in the wilds of northern Nevada yields a real bundle of political advertising – much of which comes from the campaign to elect Representative Joe Heck to the U.S. Senate, but the fine print is almost more interesting than the ads themselves. 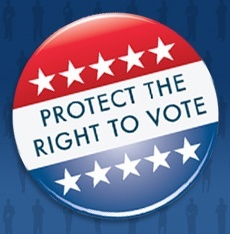 For example, during one broadcast of one network show, we’re treated to advertising from (1) the National Republican Senate Committee, two ads, (2) the U.S. Chamber of Commerce, (3) the National Rifle Association, (4) two ads from the American Chemistry Council, (5) two ads from the State Leadership Fund, (6) the National Association of Realtors, and 7) one ad from Heck’s campaign. There’s nothing unusual about the NRSC running ads in a battle ground state, especially this season. The others raise some questions. For example, the US Chamber of Commerce isn’t a bit shy of publicizing its policy priorities. Shorter version: Let the states with the least corporate regulation set the standards for determining the process for corporate management pay. Notice the part about promoting “long term shareholder value?” It’s not too hard to decipher this one. Let the states with the lowest standards of regulation be the models, and executive compensation should be based on “shareholder value,” – the model which gets us pharmaceutical executives explaining blooming increases in drug prices – and “profitability,” not necessarily corporate investment in research and development. Even shorter version: Let the corporations do what they want about executive compensation. Let’s look at another source of support for Representative Heck. The American Chemistry Council. The ALEC associated trade organization is worried that Americans will take environmental warnings entirely too seriously. Like having the Toxic Release Inventory not compiled or reported to the public as often – after all what we don’t know won’t hurt us? Remember that time when lending companies were writing mortgages hand over fist over elbow, often to very tenuously credit worthy customers? The NAR would like very much to return to that scenario. The result was the Housing Bubble, and we don’t need a repetition of that debacle in Nevada. We’re barely past the last version of exploding ARMs. And then there’s the ubiquitous NRA, what more can we say but that any regulation of firearms is anathema to these radicals – even question One in Nevada which merely calls for the implementation of background checks to every gun sale. No, it doesn’t apply if your girl friend want to borrow a gun. No, it doesn’t apply to trading guns with your hunting partner! No, it doesn’t mean you can’t share your arsenal with family members! And, no it doesn’t mean the downfall of the democracy… that’s NRA hyperbole and most Nevadans know it. The NRA hysteria is costing Americans 30,000+ lives every year, countless injuries, untold tragedy, and more suicides than we’d care to consider. Who’s NOT in favor of limiting access to firearms to felons, fugitives, the adjudicated mentally ill, domestic abusers, and unsupervised juveniles?? So, the next time there’s a wave of Pro-Heck advertising on the TV screen, read the small print at the end …. Who is supporting Representative Heck and what do they want? The Pearl Clutching is amazing! It’s also perfectly predictable. Republican candidate Donald J. Trump can say all manner of outrageous things, but let Democratic candidate Hillary Clinton call him out and the antimacassars have to be taken off the backs of the fainting couches and the pillows plumped up. Donald J. Trump: “Sadly, the overwhelming amount of violent crime in our major cities is committed by blacks and hispanics-a tough subject-must be discussed.” 1:05 AM, June 5, 2013. Donald J. Trump: “@YoungYoung54: @JeriHyatt @megynkelly @JebBush So true. Jeb Bush is crazy, who cares that he speaks Mexican, this is America, English ! !” 7:14 PM, August 24, 2015. Is anyone going to argue that these remarks from the Republican presidential candidate AREN’T racist? 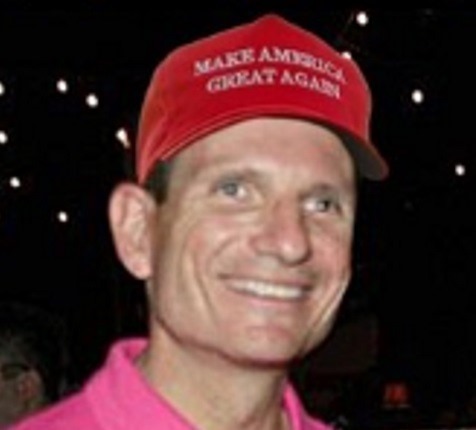 And still Nevada politicians like Representative Joe Heck will gladly don the Trump Hat. Do these comments from Mr. Trump sound blatantly racist? Stereotypically anti-Semitic? 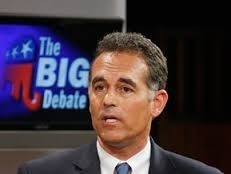 Even “deplorable?” No matter, Congressional Candidate Danny Tarkanian is still pleased to be a supporter of Donald J. Trump. But wait … there’s more. “His white supremacist fan club includes the Daily Stormer, a leading neo-Nazi news site; Richard Spencer, director of the National Policy Institute, which aims to promote the “heritage, identity, and future of European people”; Jared Taylor, editor of American Renaissance, a Virginia-based white nationalist magazine; Michael Hill, head of the League of the South, an Alabama-based white supremacist secessionist group; and Brad Griffin, a member of Hill’s League of the South and author of the popular white supremacist blog Hunter Wallace. Tell me with whom you walk and I will tell you who you are. Or, as granny used to say, “You’re known by the company you keep.” If these Nevada Republican candidates find it uncomfortable to be associated with the deplorable comments and headlines listed above – there’s a solution. Don’t support people and organizations which say or support these egregious things. Scams and Scandals: Is Nothing Enough to Put Nevada Republicans Off Trump? While the press seems obsessed with ‘foundations’ (especially if discussing the highly rated and respected Clinton Foundation) there was this timeline published on September 6, 2016. “The probe began in the fall of 2009, apparently in response to an advertisement that Trump University had placed in the Chronicle, according to an internal memo that Attorney General’s Office lawyer Rick Berlin sent to Owens and three other supervisors. “Two months later, in January 2010, the Attorney General’s Office notified Trump University it was under investigation for “possible violations of 17.46(a) and 17.46(b) of the Texas Deceptive Trade Practices – Consumer Protection Act,” records show. On May 6, 2010 the state of Texas was preparing to file suit and requested a variety of documents from Trump. 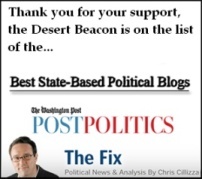 So, what has all this to do with Nevada politics? The jury is still literally out on the Trump University case, the one in which Mr. Trump famously declared he couldn’t get a fair hearing because the judge (Curiel) is of Mexican heritage – but we can get a bit of information about Nevada candidates for whom the Trump University/Trump Foundation/Trump Institute morass isn’t troubling enough to warrant putting some distance between themselves and at least the “optics” of the Trump scams. What seems particularly troubling is that when the Governor and the Attorney General are supporting the candidacy of Mr. Trump the ‘optics’ appear that they would not be interested in pursuing any litigation against Mr. Trump’s scams. Representatives Heck and Amodei seem not concerned enough to distance themselves from the candidacy. If the Trump University scandal is insufficient incentive to put some distance between themselves and Trump’s candidacy perhaps there are other items which might cause them to back off? Nevadans are usually particularly sensitive to casino operation policies. Trump’s were highly questionable – enough so that he’s no longer in the casino business. Surely such a record would cause Nevada politicians to retreat from the prospect of supporting Mr. Trump? Evidently not. Perhaps some highly questionable name-licensing agreements would be enough to make Nevada politicians uncomfortable? Especially if the agreements involved real estate transactions? Either Mr. Trump is not being honest about his relationship with these failed developments, or he is remarkably naive about to whom and under what circumstances he licenses his name? Perhaps they can sputter about the “e-mails,” a large nothing-burger of specious speculation and Republican investigations of the investigations and the people investigating the investigations … or the Clinton Foundation with its top ratings from Charity Navigator and Charity Watch [AP] but the hard facts remain that Mr. Trump has been and may continue to be involved in practices which are illegal at worst and ethically questionable at best. Representatives Amodei, Hardy, and Heck, Attorney General Laxalt, and Governor Sandoval should be asked directly how they can continue to support a presidential candidate who has demonstrated a willingness to break the rules of casino operations? To engage in housing discrimination? To refuse payment to employees and contractors (including his own campaign staff)? To engage in unlawful immigration practices? The answers should be enlightening? Comments Off on Scams and Scandals: Is Nothing Enough to Put Nevada Republicans Off Trump? 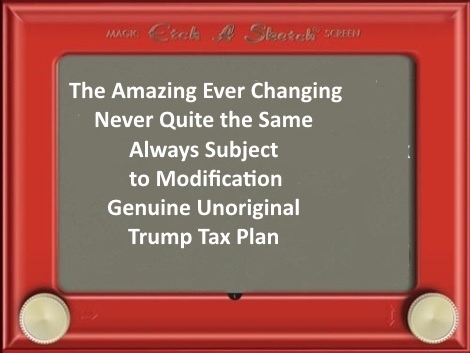 It’s time to haul out the old Etch-A-Sketch template from the Romney campaign for another deployment in the Trump 2016 version – Trump has offered two tax policy proposals. Neither one accomplishes much more than exacerbating the problems of the current tax code; in fact they’d both do more damage than good. Representative Joe Heck (R-NV3) candidate for the Nevada Senate seat and Danny Tarkanian, perpetual candidate and now a contestant for the 3rd Congressional District seat, have both endorsed Donald Trump as their choice for president, and here’s what they’re getting in the bargain. As everyone who has ever filed with the IRS knows full well, what a person actually pays is tax on the adjusted income – income after deductions. If we don’t know what the allowable deductions are then it’s almost impossible to discern what the tax proposal actually means for the average tax payer. It also isn’t helpful that the ‘defined brackets’ have been removed from the policy section of the Trump info-site. We can guess that the 12% rate goes for those with taxable incomes between $25,000 and $50,000; 25% for those with taxable income between $50,000 and $150,000; and, 33% for those with taxable income over $150,000. Who plays in the Brackets? Here comes the fun, and the way the Trump Tax Plan benefits the upper income earners. We need to look at Trump’s “pass through entities.” This is a loophole not only large enough to drive a tractor trailer through, but most of the freight cars on the Union Pacific as well. In 2012 the state of Kansas under the direction of Governor Sam Brownback and a GOP controlled legislature enacted this loophole with disastrous budget results, because of reduced taxation rates for LLC’s, S Corps, partnerships, farms, and sole proprietorships. Thud. That’s the sound of budget and revenue problems hitting the floor as a result of a ‘carve out’ for the top income earners disguised as a tax cut for small businesses. Here’s a simple example. If I were earning $165,000 per year working for the Acme Explosives Company, I would ask my employer Wile E. Coyote to immediately re-hire me as an “independent contractor.” I would re-create myself as an “S” corporation. Handy, since I live in Nevada which doesn’t have a personal income tax, and thus doesn’t recognize the federal S corporation election. I file the paperwork, get my EIN number, pay some fees, and bingo! – I am taxed at the 15% rate rather than 33%. There is obviously no job creation here – just a wonderful and perfectly legal way for me to reduce my “bracket” at the expense of those who don’t have the wherewithal to follow my shady example. Trump, Tarkanian, and Heck would seemingly like to have Nevada and 48 other states go the way of Kansas? Only if we’d like to raise tax avoidance and cheating to an art form. Playing with Children: Another element of the Trump Tax proposal is the child care tax deduction, and here too the top 1% fare very well thank you. It’s important to remember at this point that the economic value of a tax deduction increases with the marginal rate of the payer. Or, the higher your tax bracket the more valuable the deduction – for child care. The deduction is of no use whatsoever to someone already in the Zero bracket but is ever so helpful for those in the upper income levels. Playing for the Children: Mr. Trump is pleased to tell us that the Federal Estate Tax is a “horrible weapon which has destroyed many families…” Not. So. Fast. “Today’s estate tax is only imposed on less than 0.2 percent of households. Fewer than two estates in a thousand pay it. More than 2.5 million Americans die each year, but less than 5,000 estates were taxed in 2014. Only estates of $5.4 million or more must pay any estate tax at all.” [C&L] Perhaps it is not too much to return to the appellation “The Paris Hilton Legacy Protection Act,” for this long sought GOP gift to the rich. #1. What exactly are the specified brackets in the modified Trump tax policy proposal? We can assume that the new rates apply to the old brackets but without clarification from the campaign there are significant questions about the revenue projections (or revenue deficit projections) which remain unanswered. Do those brackets leave us with a revenue deficit of $3 trillion over ten years? [Tax Analyst] If so, thus much for budget balancing and other forms of fiscal contortion. #2. Does Trump mean to allow individuals to avail themselves of the Great Pass Through Tax Dodge? If so, how does he intend to avoid what’s happened in Kansas? #3. Does Trump intend to provide child care deductions for the rich while working families see none of the economic benefits of it? #4. Do Mr. Trump, Mr. Tarkanian, and Representative Heck really mean to advocate for estate tax avoidance for those estates of $4.5 million or more? For less that 0.2% of the United States population? We may have to wait for Trump Tax Policy 3.0 before these questions can be fully answered? Then there’s the infamous disparagement of John McCain’s service: “He’s not a war hero,” Trump said at the Family Leadership Summit, during a discussion. “He was a war hero because he was captured. I like people who weren’t captured.” […] Trump almost immediately denied saying McCain was not a war hero, and then criticized the senator for not doing enough for veterans.” [Politico] This from a man who got several deferments from service during the Viet Nam war – and who was comfortably at home while McCain was imprisoned. “I watched when the World Trade Center came tumbling down. And I watched in Jersey City, New Jersey, where thousands and thousands of people were cheering as that building was coming down. Thousands of people were cheering.” [Newsday] This has been thoroughly debunked! I’m not sure anyone will ever be able to explain to Mr. Trump that the reason the United States and other nations signed the Geneva Accords was to PROTECT THEIR OWN TROOPS from inhumane treatment. But, wait, we can’t leave out Trump picking a fight with a Gold Star family. “I saw him. He was, you know, very emotional. And probably looked like — a nice guy to me. His wife, if you look at his wife, she was standing there. She had nothing to say. She probably — maybe she wasn’t allowed to have anything to say.” [Newsday] Oh, please, that’s been explained, and Mr. Khan is the furthest thing from a misogynistic caveman of the Trump variety one can think of. “I’m afraid the election is going to be rigged, I have to be honest.” [Newsday] We ought to take a closer look at this one. He continued: “She can’t beat what’s happening here,” the Republican presidential nominee told the crowd in Altoona on Friday night. “The only way they can beat it, in my opinion, and I mean this 100 percent, if in certain sections of the state they cheat, OK?” [NBC] (emphasis added) Now just where might those “certain sections” be located? We’ve moved from dog whistle into bull horn territory here – he’s obviously speaking of urban, predominantly African American or minority, neighborhoods. The premise here is that if a candidate gets votes from “others,” like Hispanic, African American, or other ethnic minority voters then the election is “rigged.” Alternately, only white voters cast legitimate ballots – ergo, only elections with all white voters are legitimate. White Nationalism/Supremacist thinking on parade for all to see. But wait, there’s more! With the addition of Stephen Bannon to the Trump-Pence campaign we can expect more of this. So, let’s review. Candidate Heck has been endorsed by a campaign which has insulted __ Women __ LGBT__Native Americans__African Americans __Hispanic Americans __ Veterans __Muslims__ The US Military __ The US Intelligence Services (check all boxes). Further, the campaign refuses to release Trump’s Tax Returns. Remember the fuss Trump raised about Obama’s birth certificate and records from Columbia University? 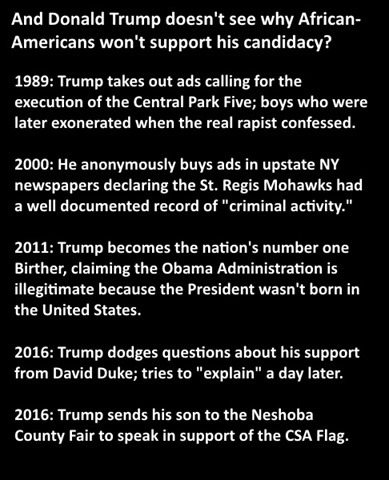 Evidently, the rules that apply to other candidates and incumbents do not apply to the Mighty Trump. You read this correctly – all the protections in place to correct the banker’s reckless actions leading up to the last Recession will be wiped away along with any protection from predatory lenders. Translation: No increase in the federal minimum wage. Open carry, of anything, anywhere in a nation coping with mass shootings and tragic loss of life. This is about as anti-choice as it gets. Translation: “Premium Support” = Coupons. My, my, I seem to remember an advertisement from the Heck camp recently telling me that he supports Medicare? Maybe not quite?? Representative Heck is now associated with not only an unpalatable platform from a reactionary party, but also with a white-nationalist, misogynistic, bigoted, abrasive, bullying campaign. It will be interesting to see how candidate Heck responds to his recent endorsement. And, this is the man being supported by Representative Joe Heck, Representative Mark Amodei, and Representative Cresent Hardy.